Proper preparation for any task will ensure better results. Unfortunately, prep work is rarely exciting, although it’s almost invariably necessary. If there was a way to decrease the difficulty and duration of the preparatory steps for any procedure, you’d want to know, wouldn’t you? Well then, my charcoal grilling friends, I am about to become your new best friend because of the marvelous device I’m going to share with you! The charcoal chimney starter is a remarkable invention, and if you haven’t got one, you’re going to want to pay attention. The worst part about charcoal grilling is, arguably, lighting the briquettes or charcoal. Electric starters can be dangerously hot (I still have a faint scar from a mishap that occurred more than 35 years ago), lighter fluid isn’t the most environmentally friendly choice, plus it can be dangerous. As for simply trying to light the pile with matches, don’t even get me started. With a chimney starter, you just light it up and walk away. Actually, don’t walk too far away; it’s never good to leave burning things unattended! The point is, this deceptively simple device can fire up your charcoal easily and safely in about 15 minutes. But, as with most products, there are many choices out there. In this article, we’re going to look at some of the best selections available, help you learn what features to look for, and ultimately make the choice for the best charcoal chimney starter for you. What the Heck Does it Do, Anyway? Why You Definitely Want This When You’re Grilling! Choice can be a good thing, and a bad thing, for the consumer. While it’s good to have options, too many choices can be overwhelming, especially in the absence of good advice. Not everyone has access to a barbecue specialty boutique, so here’s a handy guide for chimney starter shopping. Great question! I’ve said you’d love it, but I haven’t told you why. In a nutshell, a charcoal chimney starter is probably the most efficient and simple way to ignite the charcoal you use for your grill. Stripped down to the basics, it’s a large cylinder with a handle on one side, and a series of perforations around the base. Inside the cylinder, there’s a grate near the bottom for separating the charcoal from the fire starter. Remove the cooking grill from your cooker. Place the chimney either in the bottom of your cooker, or on another surface where it is safe to light a fire, such as on another cooker. Fill the top section with charcoal briquettes. Ignite the paper through the holes all around the bottom of the starter. After about 15 minutes, the fire should have reached the top of the pile. Once all the briquettes are gray, take the starter by the handles and pour the coals carefully into the bottom of your cooker. If you’re more of a visual learner, here’s a basic video tutorial on using a chimney. Every one works essentially the same, so don’t worry if this model looks nothing like the ones you’re considering. Not only are they time-savers, but they also run on newspaper, something many of us have available. If you don’t have newsprint around (and you’ll want to avoid the full-colour flyers – too many chemicals! ), other paper will do, or you can use starter cubes. They are a safe alternative to lighter fluid, and won’t impart the same taste of fuel that lighter fluid sometimes does. You’ll have hot coals in no time, safely prepared for a minimum of expense. You’ll want to try to find a starter that holds enough charcoal in one load to fill your cooker. If that’s not possible, you can always add more charcoal to the pile in the cooker, or hold back a few briquettes in the starter to use to ignite more charcoal. The bottom pieces will be nice and hot, and should ignite new pieces rapidly. There are different size models to choose from, each good for a different size of cooker. For example, if you want to use it camping or tail-gating, you’ll want a smaller starter that holds a little less charcoal. Proper ventilation is essential to a good burn; without oxygen, there can be no fire. Make sure the chimney you choose has plenty of vent holes around the base and up and down the main body of the cylinder. As you might imagine, the exterior surface of the chimney gets very hot. That’s why most models come unpainted – only specialist high-temperature paints will hold up well to this kind of heat. Just to be safe, avoid painted versions in favor of plain metal. I’d also keep away from models with wood handles. Although the heat shouldn’t be an issue, it’s still wood near the fire, and that seldom works out well. Throughout history, people have tried to cook on anything that produces fire or heat, to varying degrees of success. It should come as no surprise, then, that some folks like to cook directly on the chimney starter! All you need is a grate that fits the opening of the chimney, or you can use skewers to suspend the meat over the flame. Some folks will prefer using a cast iron pan or wok to keep the meat out of the direct flames. The intense heat will cook a thin steak (under 1” thick) in record time. Perfect when you’ve got a hungry crowd, or if you have limited space for a full-size grill. Be warned: the heat is intense at the top of the chimney! One extreme griller on the internet reported a temperature of 800F – no wonder this is sometimes referred to as the “Afterburner method” of grilling! You’ll get a first-rate sear in minutes at temperatures like that. I may have mentioned once or twice that chimneys get intensely hot. For that reason, you’ll want to be very careful with yours. Don’t use them around children, or let children handle them. You’ll also want to keep them away from flammable material of the sort commonly found in backyards (like patio furniture, piles of leaves, wooden decks, pets, etc.). Exercise particular caution when pouring coals into your BBQ or smoker. Perhaps the biggest drawback of a chimney is the need to move lit coals around. My best advice is to light it up as close to the cooker as possible, if not actually in the cooker itself. Ok, we’ve finally arrived at the meat of the article, the part where I steak my reputation, and grill the competition… and, I promise I’ll never do that again. There are oodles of seemingly identical chimneys on the market. Let’s have an up-close look at four of the best, and see if we can figure out what’s best for you and your charcoal cooking needs. 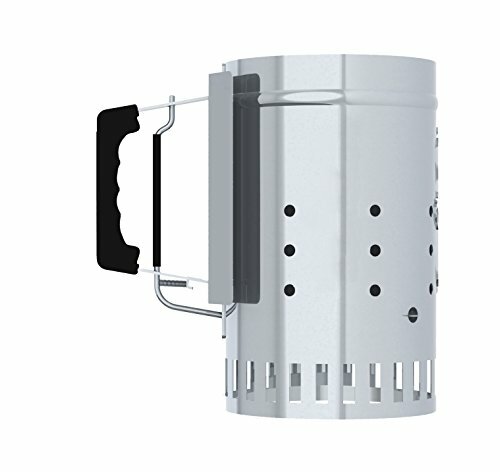 The Weber chimney is from one of the best known and most-trusted names in outdoor cooking. The company has been in business since 1893, and they’ve been making and selling barbecues since the late 1950s. These guys know grilling. The 7416 Rapidfire chimney charcoal starter is the quintessential chimney. It’s a basic Aluminized steel cylinder, with little in the way of ornamentation, save for the Weber logo emblazoned into the heat shield and on the handle. I like that there’s no paint to flake off or discolor, and it should be rust-resistant. The bottom section, where the fire starter goes, is thoroughly vented all the way around, which will let the starter material burn more easily, and allows you to light it without having to pick it up. The internal grate separating the charcoal from the starter is conical, providing better draw through the chimney, and faster overall burn time. I’m not great with physics, but the cone shape amplifies the chimney effect and causes more briquettes to light at the same time right up through the pile, instead of having to work up from the bottom layer. The handle is thermoplastic and will stay cool even when the chimney is fully ablaze. The heat shield adds an extra layer of protection for your hand, and a secondary handle allows for great control as you pour the lit charcoal into your cooker. The extra handle helps make up for the issue endemic to all top-dumping chimneys: strategic placement of the briquettes or lumps can be difficult when you’re just dumping them out one-handed. This isn’t the largest model on the market (7.5” in diameter X 12” tall), and some folks might find it doesn’t hold enough charcoal for their cooker. However, by dumping out only a portion of the lit coals and then adding fresh briquettes to the already glowing charcoal should get them burning even faster than the first batch. You’ll be topped up in no time! The bottom line on this chimney is it’s a great all-purpose starter. If you’re new to charcoal grilling, you’ll appreciate going with a name you probably know. And, if you’re an old pro, you already know this is a name you can trust, and you’ll love the simplicity of just lighting it up and letting it do its thing. If you want to have a closer look, or you want to order yours now, here’s the link to jump over to Amazon. Let’s just admit it, shall we? Chimneys look cool, and they provide an extreme cooking platform for those who love to cook on the edge! However, their raison d’etre is the rapid ignition of charcoals. A good chimney will get your charcoal fired in 10-20 minutes. Heck, my oven takes that long to warm up, and I know which one I’d rather cook on! There are a lot of grill accessories and products out there, but Char-Griller is the real deal. They’ve been making outdoor grills and smokers for a long time, and pride themselves on quality products for grilling enthusiasts, not backyard makeover types. 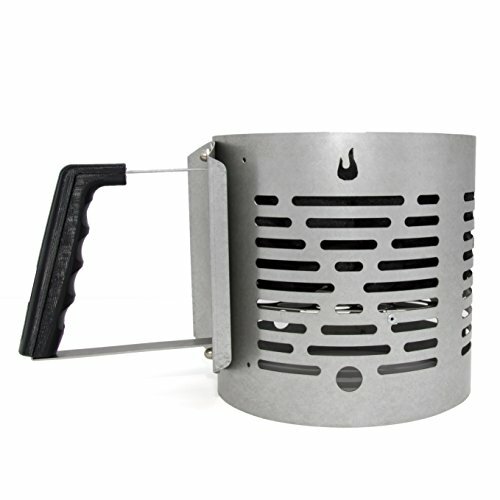 The quality and practicality they espouse on their website is reflected in this chimney starter. This Char-Griller offering is zinc-coated steel, and seems devoid of paint or decoration – good! Ventilation holes abound on this unit, ensuring good availability of oxygen for the fire. The starter section is also well ventilated, and lighting your source material will be no problem. The handgrip is nice and large and made of ABS plastic. Between the plastic and the built-in heat shield, you won’t have to worry about accidental burns, assuming you don’t touch the actual chimney! There is one unique feature on this model that I didn’t find on any other units. In front of the handle is a release lever for the bottom of the chimney. Just like a railroad coal hopper, this chimney can be unloaded from the bottom. This eliminates the lack of control one might experience dumping a couple of pounds of burning charcoal out of the top. With a little care, you should be able to place the briquettes in whatever formation best suits you and your cooker. Of course, any time you introduce moving parts to a device, you increase the odds of failure exponentially. I think this is a great feature, but I have concerns about how long it will last, and the possible ramifications of unexpectedly dropping a load of smoldering charcoal. Try as I might, I can’t find much wrong with this chimney, other than that it is designed to work optimally with a grilling system not everyone has. The bottom hatch should still be a great feature for non-Char-Grill grillers, however. Recommended for all charcoal cookers! They say that good things come in small packages, but others are adamant that bigger is always better. (Hangovers not withstanding.) The truth is closer to this: always use the right tool for the job. For example, if you love grilling while you’re away camping, at a picnic, at a tailgate party, or if you simply enjoy whipping yourself up a small cut of meat on a hibachi, you really don’t need a huge pile of charcoal. 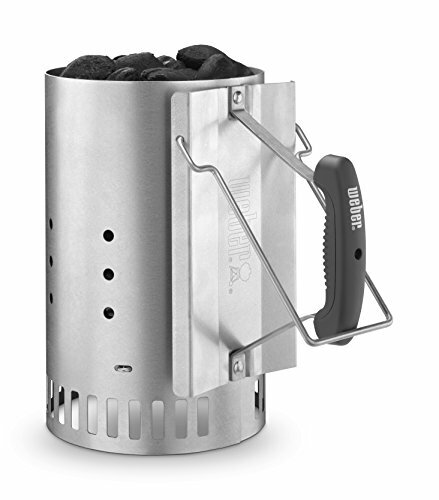 Weber’s 7447 Compact Rapidfire chimney starter does the same job as its big brother, but is smaller all around. Coming in at a little over 8” tall and 5.75” in diameter, this little guy is just the thing for grilling away from home or small cookers. It has many of the same features as the larger Weber model, including plenty of vents, plastic handle, and a heat shield. It does not have the second handle, but given the small size, I can’t imagine needing it, anyway. I kind of like the aesthetics of the small model, with the handle sticking way out the side. It’s a bit like a metal beer mug! And the long bottom vents with the rounded ends seem vaguely like something out of the carbon-freezing chamber in The Empire Strikes Back. Some folks have reported that the handle does heat up on the smaller unit, so it might be wise to wear gloves with this one, just to be safe. Perhaps the smaller cylinder keeps the heat more concentrated toward the center? You may also find that the smaller opening does not lend itself to using lump charcoal. Still, having to buy a small bag of briquettes for your cookouts away from home isn’t the end of the world. If you’re trying to save a few bucks by getting the smaller unit, but you’ve got a full-sized grill, you will be disappointed; it won’t hold nearly enough charcoal. It is ideal, however, for its intended purpose, which is providing fuel for small grills on special occasions. Every time I pack up the SUV to hit the road for a day out at the park, or maybe a weekend away camping, I fill it up to the roof! I thought going from a car to a ute would leave me plenty of extra room, and it did. The trouble is, I just fill it with more stuff! If there’s a travel-size version of any of the “essentials” I take with me, I want to know, because space is at a premium. Sound familiar? Well, it’s the Char-Broil Half-Time charcoal starter to the rescue! This thing is the sawed-off shotgun of chimney starters. Like the big guys, it fires up briquettes far faster than traditional methods. Unlike them, it’s compact and ideally suited to portable grills or those they have waiting for you mounted on poles at the park. Char-Broil is a respected name in grilling, and they’ve been turning out barbecues since 1948. So yeah, they know what charcoal cooking is about. As you’ve probably figured out by now, I prefer my chimneys without paint or unnecessary ornamentation. The Half-Time does have a Char-Broil flame logo cut-out near the top, but I kinda like it, so I’ll let it slide. The cylinder is made of aluminized steel, so it’s durable and rust-resistant. The handle is plastic and has a nice molded grip with a spot for each finger. When you’re carrying a bucket of hot charcoal, having a good grip is essential! As with all smaller chimneys, this probably won’t do you if you’re using a full-size cooker. This pint-sized pail is strictly for camping, tail-gating and compact grills. Video evidence on the manufacturer’s website shows the Half-Time getting fully fired up in about 15 minutes. This unit is a great choice for those times when you don’t need a full load of charcoal, or when you’re trying to pack light for grilling away from the backyard. If you’re a charcoal griller, and if you’ve read this far I’ll assume you must be, then you’re probably pretty fired up about trying a chimney starter of your own? 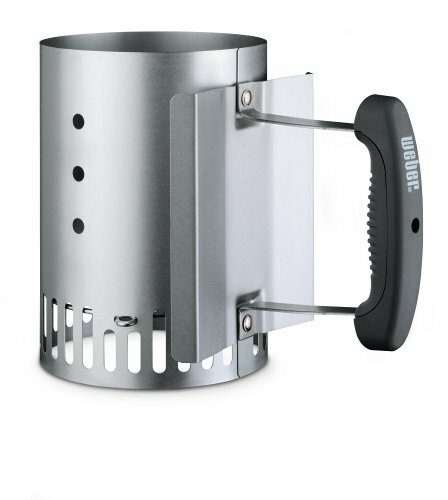 For overall versatility, material quality, and projected life expectancy, the Weber 7416 Rapidfire Chimney Starter is our charcoal starter of choice. I love the simplicity and reliable construction of the chimney, and the conical internal grate gives it a leg up on the competition. As always, please feel free to let us know your experiences with these or any other grilling goodies, and share your tips and techniques.